Poor old king Tut has made the news again – for all the wrong reasons, again. In a documentary that aired on the BBC two weeks ago, scientists based at the EURAC-Institute for Mummies and the Iceman unveiled a frankly hideous reconstruction of Tutankhamun’s mummy, complete with buck teeth, a sway back, Kardashian-style hips, and a club foot. They based it on CT-scans of the mummy from 2005 and their own research, claiming to have identified a host of genetic disorders and physical deformities suffered by the boy-king, who died around age 19 some 3,300 years ago. The English-language newspaper Ahram Online has aired the views of three Egyptian Egyptologists who are just as shocked by the reconstruction as many television viewers were. There are old and understandable sensitivities here: Western scientists have been poking around Egyptian mummies for more than 200 years, while the discovery of Tutankhamun’s tomb in 1922 coincided with the birth of an independent Egyptian nation after decades of European colonialism. The ensuing tussle between excavator Howard Carter and the government authorities, over where the tomb finds would end up (Cairo won, and rightly so), highlighted deep-seated tensions about who ‘owned’ ancient Egypt, literally and figuratively. It’s safe to say that the last century has seen king Tut more involved in politics than he ever was in his own lifetime. Most Egyptologists can readily debunk the ‘evidence’ presented by the EURAC team – if we weren’t so weary of debunking television documentaries already. (why do the ancient Romans get academic royalty like Mary Beard, while the ancient Egyptians get the guy from The Gadget Show?). What’s fascinating is how persistent – and how misguided – lurid interest in the dead bodies of ancient Egyptians is, not to mention the wild assumptions made about the skilled and stunning art this culture produced. The glorious gold mask, gilded shrines and coffins, weighty stone sarcophagus, and hundreds of other objects buried with Tutankhamun were never meant to show us a mere human, but to manifest the razzle-dazzle of a god-king. Around the time of Tutankhamun’s reign, artists depicted the royal family and the gods with almond eyes, luscious lips, and soft, plump bodies. These were never meant to be true-to-life images, as if the pharaoh and his court were posting #nomakeupselfie snaps on Twitter. Each generation of artists developed a style that was distinctive to a specific ruler, but which also linked him to a line of ancestors, emphasizing the continuity and authority of the royal house. 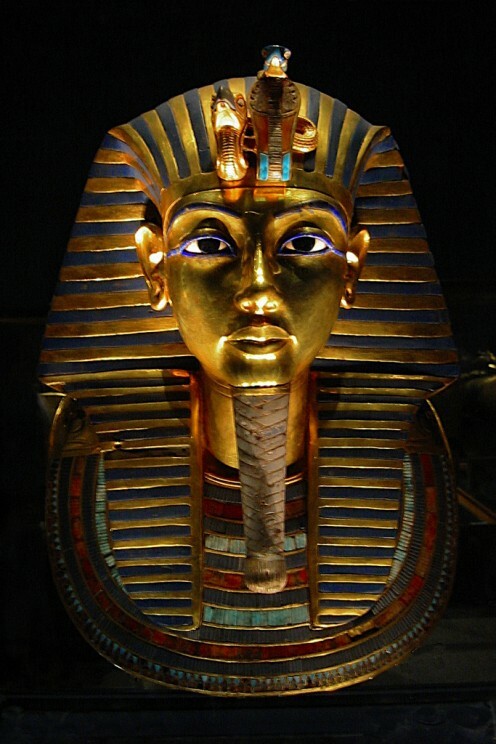 The works of art that surrounded Tutankhamun in life, and in death, were also deeply concerned with a king’s unique responsibilities to his people and to the gods. Death mask of Tutankhamun, by ironmanixs. CC-BY-NC-SA-2.0 via Flickr. All the walking sticks buried in the tomb – more than 130 of them, one of which Carter compared to Charlie Chaplin’s ubiquitous prop – emphasize the king’s status at the pinnacle of society (nothing to do with a limp). The chariots were luxury items (quite macho ones, at that), and Tutankhamun’s wardrobe was the haute couture of its day, with delicate embroidery and spangly sequins. Much of the tomb was taken up with deeply sacred objects, too: guardian statues at the doorways, magic figures bricked into the walls, and two dozen bolted shrines protecting wrapped statues of the king and various gods. Not to mention the shrines, sarcophagus, and coffins that held the royal mummy – a sacred object in itself, long before science got a hold of it. As for the diseases and deformities Tutankhamun is said to have suffered? Allegations of inbreeding don’t add up: scholars have exhaustively combed through the existing historical sources that relate to Tutankhamun (lots and lots of rather dry inscriptions, I’m afraid), and as yet there is no way to identify his biological parents with any certainty. Don’t assume that DNA is an easy answer, either. Not only do we not know the identity of almost any of the ‘royal’ mummies that regularly do the rounds on TV programmes, but also the identification of DNA from ancient mummies is contested – it simply doesn’t survive in the quantity or quality that DNA amplification techniques require. Instead, many of the ‘abnormal’ features of Tutankhamun’s mummy, like the supposed club foot and damage to the chest and skull, resulted from the mummification process, as research on other mummies has surmised. Embalming a body to the standard required for an Egyptian king was a difficult and messy task, left to specialist priests. What mattered just as much, if not more, was the intricate linen wrapping, the ritual coating of resin, and the layering of amulets, shrouds, coffins, and shrines that Carter and his team had to work through in order to get to the fragile human remains beneath. The famous mummy mask and spectacular coffins we can see in the Museum of Egyptian Antiquities in Cairo today, or in copious images online, should stop us in our tracks with their splendour and skill. That’s what they were meant to do, for those few people who saw them and for the thousands more whose lives and livelihoods depended on the king. But they should also remind us of how they got there: the invidious colonial system under which archaeology flourished in Egypt, for a start, and the thick resin that had to be hammered off so that the lids could be opened and the royal mummy laid bare. Did king Tut have buck teeth, waddle like a duck, drag race his chariot? Have a look at that mask: do you think we’ve missed the point? Like so many modern engagements with the ancient past, this latest twist in the Tutankhamun tale says more about our times than his. Christina Riggs is an Egyptologist and a senior lecturer in art history and world art studies at the University of East Anglia in Norwich, England. She is the author of Ancient Egyptian Art and Architecture: A Very Short Introduction (Oxford University Press, 2014) and Unwrapping Ancient Egypt (Bloomsbury, 2014).